what is the islamic state? to be or not to be a communisateur…? Only 2 Shoplifting Days Till…. 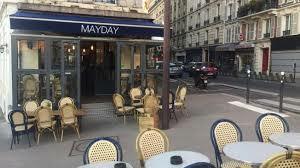 Mayday took place just a few weeks after the end of the successful movement against the CPEi . I turned up with a friend from out of town and immediately saw that the « cortege de tête » ii was a banner being held by an obnoxious Trotskyist from what at that time was called the Ligue Communiste Revolutionnaire (they dissolved shortly afterwards and became a bit more eclectic, but no less devious, under the name Nouveau Partie Anti-Capitaliste – the New Anti-Capitalist Party). This guy had threatened to thump a friend of mine a few days earlier when we’d invaded a local meeting of theirs’. During the anti-CPE movement he’d deliberately manipulated people into hurriedly leaving an occupation of the Chamber of Commerce (which the occupiers had only just voted in favour of continuing indefinitely) by saying the CRS riot cops were about to storm it, when they were just gathering outside as normal, not doing anything that people hadn’t been aware of 15 minutes before the vote to continue occupying had taken place. I started to get angry with him as he looked down at me with an insufferable arrogant contempt, telling him to retreat to a different bit; my friend felt the confrontation was about to become physical so, unsympathetic and unaware of what was behind my anger, he rather cowardly disappeared (it turned out he went off back to the squat he was staying in). I spoke to some radical students who were just behind this Trot hack and said they’d tried to get him to move as well but he’d just simply refused and they hadn’t felt it worthwhile getting violent with him. The march started to move off even as the students started jostling for first position, which by that time had been taken over by the CGTiii. I remonstrated with the CGT demo stewards, and so about 4 of them tried to trip me up – which if successful may have led me to being trampled as the start of the demo was on a fairly steep hill and there were two or three thousand starting to march just behind me. I managed to maintain my balance, shouting to one of the stewards « Stop, stop ! » but using the wrong familiar « tu » form in French rather than the supposedly correct « Vous » form, to which this CGT cop replied « Vous me tu toyez.. ? » – ie « You’re impolitely being familiar with me ? ». I was about to reply that I could never master the difference between « tu » and « vous », but thought that was inappropriately polite given the hostile circumstances and simply said, « During the French revolution it was forbidden to use the ‘vous’ form », a lesson in French history coming from an English guy that obviously irritated him further. The students managed to stop the march, holding it up by having a big argument with the CGT demonstration stewards, with the cops intervening trying to calm things down. This dragged on for at least 10 minutes until the cops managed to get some kind of agreement between the two sides. At this point I slagged off the demo steward who I’d had the (unconscious) audacity to use the « tu » form with, saying it was typical for the CGT to work hand-in-hand with the cops. Sneering, he haughtily waved me away with both hands like some aristocrats or superior hierarchs sometimes do with just one hand. I did a pretty good impression of him, mirroring to him in imitation of what he was doing to me and he exploded furiously. At this point the demo again stopped, starting to get agitated and the Captain-of-Police for Montpellier rushed over, incandescent, red-faced, pushing me with both hands, shouting « Get off this demonstration, get off !! I’ve seen you everywhere on demonstrations – get off, get off !! ». He must have pushed me 4 or 5 times before other cops came over to calm him down – after all, I hadn’t been violent or done anything illegal ; but imagine how it must have been for him to have to be pacified by those lower in the hierarchy than him, the city’s Captain-of Police ! I rushed down the hill towards some friends who’d been waiting on the side to do some street theatre. They were dressed like bourgeois, sitting on the side in deckchairs, sipping champagne out of champagne glasses (that happened to be plastic), binoculars at the ready, aiming to treat the march as if it was the Tour de France. « So that’s why we had to wait half an hour » a friend said as I explained the delay. As the first section of the march began to proceed in front of us, the street theatre idea went into play as someone shouted a running commentary into a megaphone « It’s the Unef in front – now being taken over by the CGT, and yes – it looks like Force Ouvriere coming from the outside, but no it’s the CFDT and yes – it’s the CFDT in front… !!! » etc. etc. Given the tensions of just a few minutes before, the union hacks quite appreciated this piss-take and were seen laughing at the joke. Which kind of missed the point of it, though perhaps it was my friends who’d misunderstood the point – even bureaucrats don’t care about being made fun of if it’s done as « theatre » ; what they can’t stand is serious opposition, even serious opposition that uses humour as well. The clash between the students and the CGT made it to first spot on the TV news that evening. Next day, in the local rag (Midi-libre) a small photo appeared of me looking furious whilst arguing with someone. How’s that for street cred ? i The 2006 movement against a law creating precarity amongst the young, which gave those employed for the first 2 years in a job far more restricted “rights” than their older fellow workers. This movement involved General Assemblies open to everyone and loads of independent actions, strikes, occupations, riots etc. Because of the massive autonomous revolt against this law, the ruling class were forced to retract it. See this : “all quiet on the french front”. ii The leading section of a march, invariably contested by the different organisations hoping to gain the most publicity for their gang. I’ve seen you everywhere on demonstrations… are you really that ubiquitous? Do the cops really monitor individuals present that thoroughly? Montpellier is a relatively small city – and at that time the population was considerably smaller (the greater Montpellier area has about 1000 people per month moving to it – in other words, 12 years ago there were something like 140,000 less people in the city and around it than there are now). Demonstrations are rarely massive – and the captain of police had obviously seen me on loads of big and small demos at the time of the movement against the CPE. I’d seen him as well, as he had a fairly distinctive moustache. Possibly I was noteworthy because of my age and grey hair, since the vast majority of the demos against the CPE involved people a great deal younger than me. In fact, I got very paranoid after this, and rather insanely so.